Replay Music locates the web address of the music file you are playing, reconnects to the host server, and makes an exact copy of the file on your Mac. Typically, this download process is much faster than actually playing the file. Once the download process starts, you can close audio player, and the file will continue to be captured. Note: Some web sites use encryption when streaming audio. Replay Music cannot downloaded these encrypted streams. However, with the new Audio Recording mode, they can be recorded in real time as they play on your Mac. See below for more information on using the Audio Recording mode. Open Replay Music and set it to Streaming Mode (default setting) and switch on the monitoring button. 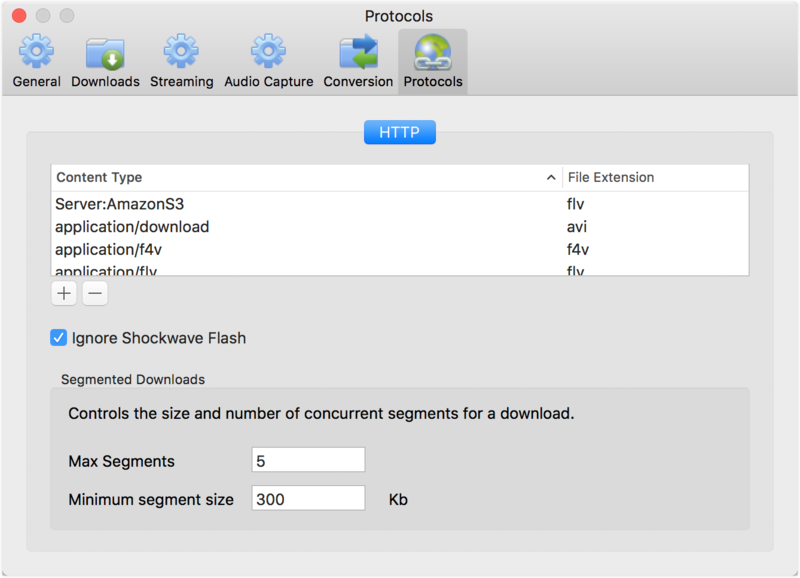 Any compatible non-encrypted audio stream that you play on your Mac will be downloaded. When Replay Music is actively monitoring for media to record, the ON/OFF slider changes to the ON position. When Replay Music is switched OFF, nothing will be downloaded until it is switched on again if it is in Streaming Mode. Replay Music also features a URL downloader bar, where you manually enter the URL address of the audio file that you want to download. Then press the GET button or hit enter/return. The file will then download. 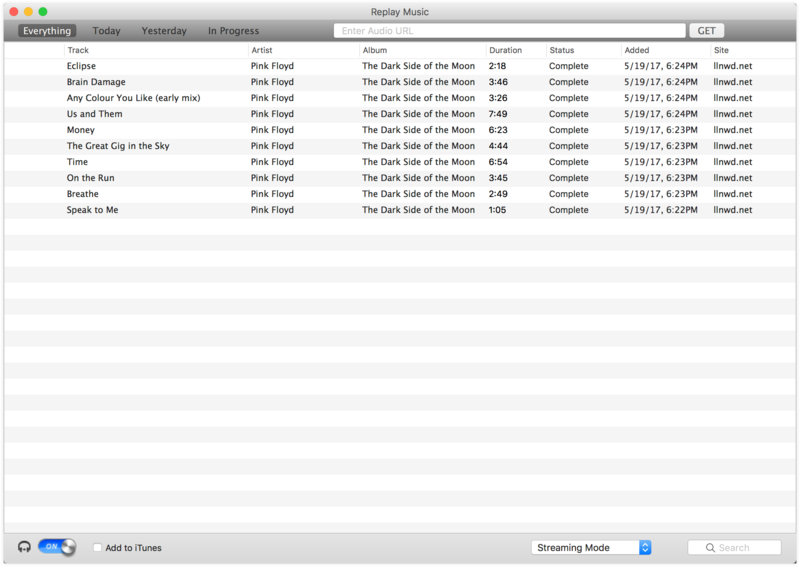 Replay Music for Mac now has the ability to record any audio it hears. This mode of recording is best used with sites and services that cannot be downloaded in Streaming Mode (like Spotify). With Audio Capture Mode, Replay Music listens and will record the audio as it plays in real-time. To begin recording in Audio Capture Mode. Switch the monitoring button to the ON position. Change the mode to Audio Capture Mode. Replay Music will now start listening for audio and will begin to record and tag the tracks it hears. Be careful to not have any other audio play other than what you want to capture. Be aware that system sounds could also get recorded. So long as there is discernible silence between the tracks you play, Replay Music will automatically spit them into separate tracks. Replay Music uses a digital fingerprinting technology to automatically recognize and tag the music you have downloaded or recorded. In some cases the track may not be identified by the music database, or you may wish to change the tag. You can easily edit the track tag information from within Replay Music. Audio Device: By default Replay Music will use Soundflower (2ch) as the audio device to record when you want to record sound that is playing on your Mac (like streaming music). Soundflower is installed with Replay Music. When Soundflower is selected as the audio device in Replay Music, it will also switch your Mac audio input device to Soundflower as well. When you're finished recording, it will automatically switch back to your previously assigned audio input. You can also set the Audio Device to record from other inputs from the drop-down menu. Split On Silence: Allows for a recording to stop and start again once audio levels drop to a certain threshold percentage, for a set maximum amount of time. This is so that it can detect breaks in between songs on a playlist and separates the tracks. You must click outside of the box in another box when you change a value for it to take. Record Silence: Determines how long Replay Music will continue recording once no more audio is detected before it stops. This is to prevent it from recording indefinitely once a track has finished. Conversion Location: set the folder that you would like Replay Music to save your converted files. Max number of segments: When Replay Music downloads, it asks for different parts of the media simultaneously. This effectively speeds up the downloading process. If you find that Replay Music is using too much network bandwidth to record, reduce this number. Increasing this to more than 5 segments won’t speed up downloads though.